Tow floats are a great way to increase visibility and carry extra kit while you are swimming but they are not the easiest thing to run with! Read on for advice on which to choose and how to manage it during a Swimrun. Tow floats are a great bit of safety kit for open water swimmers. The idea is simple – a brightly coloured, inflatable device is tethered to the swimmer around the waist and towed along behind them whilst swimming, increasing visibility to other water users and if necessary, providing buoyant support if the swimmer needs to rest or wait for assistance. During some SwimRun races (including Love SwimRun if you are entering as a solo) competitors are required to use a tow float. This is for safety reasons and so we can see you easily as you won’t have a partner to help you if you get into difficulties. Tow floats come in a few shapes and sizes, from a simple inflatable bubble to doughnut shaped floats with a bottle holder or dry space inside to carry food and a phone to large dry bags allowing you to carry all your belongings along with you. This is a great feature if you want to do long one ways swims, need to get out mid swim or just don’t have anywhere secure to leave your belongings. They are great to use for security if you are swimming alone or if you are doing a long swim and want to carry some food, drink and your phone etc. Some now have pockets with clear windows that are great if you need to carry a map etc. 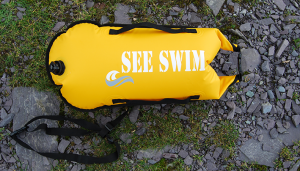 There are various tow floats manufacturers including SwimSecure, Lomo, SeeSwim, Puffin Swim and Zone3. Take a look at them all and think about what you want to use it for before you buy – if you just need a simple float for visibility or to tick the box for an event go for a lightweight, cheaper model, but if you want to use it for bigger adventures or to carry some kit, look at the dry bag options. The float you use can be as simple as they come or you can make more use of it by choosing a dry bag version and and using it like a bag to carry food and drink with you, or even stow your shoes in it while you swim. You can attach a map, whistle and a small mesh bag to the outside of the bag to hold gels that you’ll then be able to access quickly without having to open the float. The doughnut shaped designs are great for carrying keys, a phone and a little food and water and the contents is accessable whilst still in the water. I also clip my waterproof camera to it and sit it on top until I want to stop and take a picture! Most of the time you don’t even notice you are wearing a tow float but if you are towing a lot of weight or are swimming into strong wind it can cause some drag. If you swim with the wind it’s possible it will blow over your back or head and get in the way of your stroke – plan your swim accordingly! If you are going to use one during your SwimRun event make sure you have practiced using it and if you are going to store kit it in, make sure you can operate the clips and valves with cold hands! Think about how you are going to manage it whilst running and practice your transitions with it. Running with a tow float is a bit more cumbersome than swimming with one. You could fully deflate it for your runs but that can be a real faff, especially when you then have to re-inflate it when it’s time to swim again – it’s not easy when you are already out of breath from running! 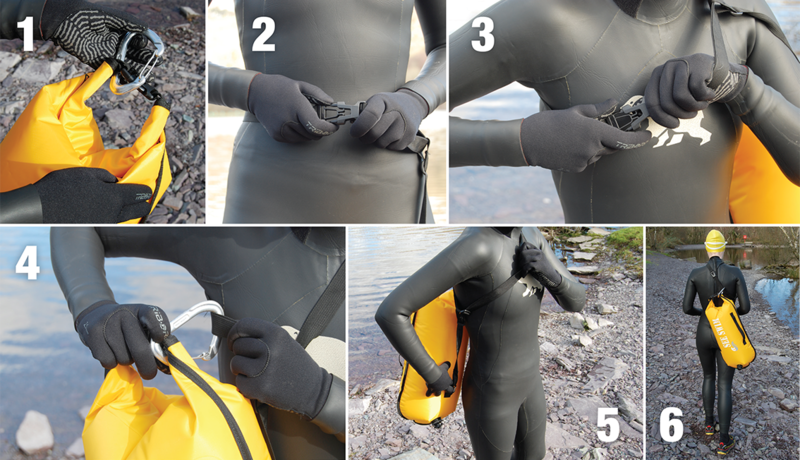 The pictures below show a simple step by step solution we’ve found to running with a tow float. It won’t suit everyone but it’s worth giving it a go! 1. Before you set off, attach a light, wire gate climbing karabiner to the handle or closure of your tow float (I’m using a dry bag style here). Make sure it is big enough that you can operate it easily with cold or gloved hands. 2. Adjust the waist loop to be as a loose as possible without it riding down over your hips as you swim. 3. Go swimming! When you exit the water undo the waist loop and bring one side of it up and over your shoulder and re-clip it to wear it like a sling/sash. 4. Grab hold of the float (deflating it is optional but I don’t bother) and clip the karabiner onto the waist loop, now underneath your arm. 5. Push the float around to your back. TIP: You can also attach your goggles and hand paddles to the karabiner when running. See Swim sent us their version of a tow float to play with. 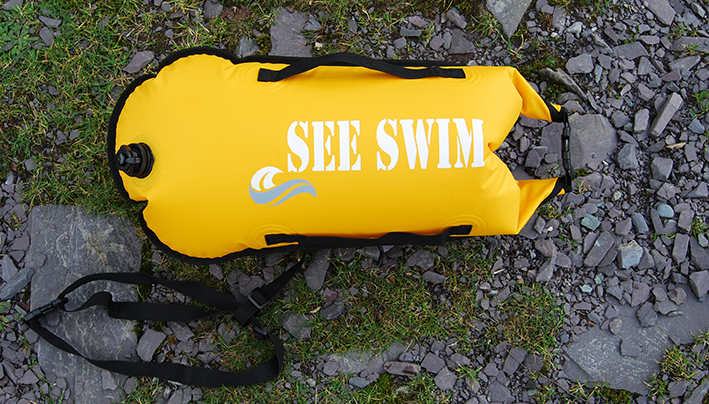 It’s a tough, yellow, 28 liter inflatable dry bag designed to allow you to carry your kit with you when you swim. Once inflated you can fit a few clothes, a sports towel and shoes in there, plus a phone and energy bar. The bag has one compartment inside with an inflatable chamber on either side to make it buoyant. These are inflated independently so if one failed it would still float and even if the bag is opened the chambers remain inflated. While it is inflated it is hard to access whatever is inside but the bag features large two way valves – this allows it to be blown up as normal but if you completely unscrew it it will deflate fully in a few seconds. This would be really handy if you needed to access what is inside very quickly (deflating though a normal valve can take a couple of minutes). This can be really useful on a SwimRun, for example, if you plan to carry your trainers in your tow float when swimming it will save you time getting them out again when you transition to a run. Other features include two nylon handles which are great for grabbing onto in the water and for holding the bag when you run. The bag is attached to the waist band via a carabiner so you can detach it if necessary. See Swim are offering all our competitors their Inflatable Dry Bag at the great price of £25 including postage, saving you £5.89! You’ll receive a special link to buy it at this price once you have entered.